Cloudy at start, clearing to sunny skies. 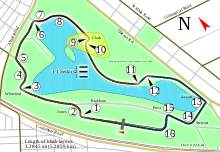 The 2002 Australian Grand Prix (formally the LXVII Foster's Australian Grand Prix) was a Formula One motor race held on 3 March 2002 at the Melbourne Grand Prix Circuit. It was the first race of the 2002 Formula One season. The 58-lap race was won by Ferrari driver Michael Schumacher after starting from second position. Juan Pablo Montoya finished second in a Williams with Kimi Räikkönen third for the McLaren team. Eleven of the twelve teams on the FIA's 2002 entry list made it to Melbourne, the Prost team having gone out of business at the end of January 2002. The Toyota team made its debut at this race, while Renault was appearing as a team in its own right for the first time since 1985 after rebranding the Benetton team accordingly. Heading into the new season, several teams opted to retain their 2001 driver line-ups, while others changed drivers. One of the main driver changes involved Kimi Räikkönen, who moved from Sauber to replace fellow Finnish driver and two-time World Champion Mika Häkkinen at McLaren. Häkkinen had opted to take a sabbatical from F1, which would eventually become permanent retirement. Ferrari retained four-time World Champion Michael Schumacher and Rubens Barrichello, while Ralf Schumacher and Juan Pablo Montoya continued at Williams. Mark Webber (Minardi), Felipe Massa (Sauber), Takuma Sato (Jordan) and Allan McNish (Toyota) were all debutants. Four practice sessions were held before the race; two one-hour sessions held on Friday and two 45 minute sessions on Saturday. The Friday sessions were held in damp and wet conditions with scattered sunshine. Michael Schumacher, the reigning champion, set the session's fastest lap with a time of 1:28.804, three-tenths of a second faster than Barrichello. Giancarlo Fisichella was two and a half seconds off Barrichello's pace, followed by Ralf Schumacher, Massa and Pedro de la Rosa. In the second practice session, Michael Schumacher set the quickest lap of the day, a 1:27.276; Barrichello finished with the second-fastest time. The Williams drivers were running quicker—Ralf Schumacher in third and Juan Pablo Montoya in fourth—with the team's Senior Operations Engineer, Sam Michael, admitting that the wet conditions affected their running plan. Saturday's weather was again damp and wet, where grip was poor and many drivers were forced to use the run-off areas after sliding off the track. The session was disrupted by an accident involving Sato in the Jordan, which resulted in a suspension as marshals cleared the track of debris. Saturday's afternoon qualifying session lasted for an hour. During this session, the 107% rule was in effect, which necessitated each driver set a time within 107% of the quickest lap to qualify for the race. Each driver was limited to twelve laps. Barrichello achieved his first pole position of the season, his first in Melbourne, with a time of 1:25.843. He was joined on the front row by Michael Schumacher who was five thousands of a second slower. The race was won by defending World Champion Michael Schumacher for Ferrari, becoming just the eighth driver to win the event three times since it was first held in 1928. Schumacher was also the first to achieve all three wins during the Formula One World Championship era. Williams driver Juan Pablo Montoya finished 18 seconds behind in second position while McLaren driver Kimi Räikkönen came home in third place and was the only other driver apart from Montoya, not to be lapped by Schumacher. The race was heavy on attrition, with eight cars eliminated in a multi-car pile-up at the first corner. Williams driver Ralf Schumacher ran into the back of polesitter Rubens Barrichello in the Ferrari. In the ensuing chaos Giancarlo Fisichella, Sauber pair Felipe Massa and Nick Heidfeld, Jenson Button, Olivier Panis and Allan McNish retired. Both Arrows were disqualified for disparate reasons. Heinz-Harald Frentzen was disqualified for leaving pit lane under a red light and Enrique Bernoldi was disqualified for changing to the team's spare car after the race had started. With six other cars retiring during the course of the race there were barely enough cars to fill the points positions. Eddie Irvine's Jaguar took fourth position while the late race battle for fifth captured the spectating crowd's attention. Mark Webber, the first Australian to start his home race since David Brabham eight years previously, drove his Minardi to fifth position, Minardi's first points in some years. The car was wounded, missing top gear and Mika Salo closing fast. With only a lap to go Salo spun trying to pass Webber. After the race, he celebrated with an enthusiasm more than equal to winner Schumacher. Webber and Australian team boss Paul Stoddart were given their own podium celebration and Michael Schumacher's champagne bottle after the top three had left. 1.^ Takuma Sato set a time outside 107%, but was allowed to race. 1.^ Heinz-Harald Frentzen was disqualified for passing the red light at the exit of the pit lane. 2.^ Enrique Bernoldi was disqualified for changing to the team's spare car after the race had started. ^ F1 Racing. April 2002. ^ "2002 Entry List". Fédération Internationale de l'Automobile. Archived from the original on 2 June 2002. Retrieved 27 June 2014. ^ "Prost Grand Prix goes out of business". Grandprix.com. 28 January 2002. Retrieved 15 May 2017. ^ "Hakkinen takes a break from F1". The Telegraph. Telegraph Media Group. 14 September 2001. Retrieved 17 October 2014. ^ a b "2002 Formula One Sporting Regulations" (PDF). Fédération Internationale de l'Automobile. 31 October 2001. Retrieved 17 October 2014. ^ "Friday First Free Practice - Australian GP". Atlas F1. Haymarket Publications. 1 March 2002. Retrieved 17 October 2014. ^ "Friday's Selected Quotes - Australian GP". Atlas F1. Haymarket Publications. 1 March 2002. Retrieved 17 October 2014. ^ "Saturday First Free Practice - Australian GP". Atlas F1. Haymarket Publications. 2 March 2002. Retrieved 17 October 2014. ^ "2002 Australian Formula 1 Grand Prix - Qualifying Session Results". NewsOnF1. Retrieved 26 December 2015. ^ "Australian GP Saturday qualifying". motorsport.com. Archived from the original on 7 June 2011. Retrieved 26 December 2015. ^ "2002 Australian Formula 1 Grand Prix - Race Results". NewsOnF1. Retrieved 26 December 2015. ^ "2002 Australian Grand Prix". Formula1.com. Formula1.com Limited. Archived from the original on 13 October 2014. Retrieved 26 December 2015. ^ a b "Australia 2002 - Championship • STATS F1". www.statsf1.com. Retrieved 7 March 2019. This page was last edited on 7 March 2019, at 10:33 (UTC).